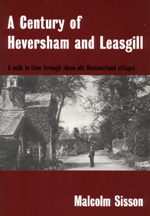 A Century of Heversham and Leasgill: A walk in time through these old Westmorland villages. Malcolm Sisson, known to all locals as ‘Mac’, was born in the nearby village of Sedgwick and spent most of his adult life with his wife Jennie, in Leasgill. Mac has been involved in most village activities including the Athenaeum Management Committee, as Clerk to the Heversham Parish Council, as a churchwarden and as a local correspondent for the Westmorland Gazette. Both Mac and Jennie have regularly attended St Peter’s Church and for many years were members of the choir. On Sundays in the early days of the century, Levens Bridge used to be lined by locals on both sides – it was a regular meeting place. Kendal Cycling Club also met there before racing to the Derby Arms (near Witherslack) and back. On weekdays, picture the scene – streams of horse-drawn carts carrying potatoes from Foulshaw, damsons from Lyth, coal to Levens, flour from Milnthorpe Station to Crosthwaite, gunpowder from Sedgwick, Edward Clark’s and Harold Hyde’s carrier carts and Mashiter’s (horse-drawn) omnibus from Milnthorpe to Kendal, also cattle and sheep being led or driven. This large house was built for the Argles family and completed in September 1859, and enlarged in 1904. The Argles family were the ‘gentry’ and owned much of the land, farms and cottages in the village. About 1927, Eversley was bought by John M. Drew, a cotton magnate from Lancashire. This is the village hall which was my great grandfather’s barn and joiner’s workshop until 1872. Lots of villages have a village hall but Heversham is unique in having an Athenaeum. The building for social, instruction and recreational use was provided for the village people in 1872 by local landowner Mr. Frank Argles who was a member of the Athenaeum Club in Liverpool - hence the name of our hall. It has been updated several times in the past 128 years and continues to be the centre for many village activities. Plumtree Hall was built c.1815 and was a private house until 1971, latterly the home of the Watson family who were much involved in helping village activities and opened the grounds for garden fetes in aid of charities. This was a village drinking water supply before piped water arrived c.1908. The well had an Appleby pump to raise the water and this could also be diverted to a nearby trough, for use by horses and cattle. The water also came to be used for steam haulage vehicles but in 1905, a notice was put up prohibiting this, as not enough water was left for village people. Heversham Hall, with its 14th century remains of a pele tower, is probably the oldest building in the parish and has been in the occupation of the Handley family since 1876. Although cockfighting was made illegal in 1849 the site of the ancient cockpit near the original Heversham Grammar School founded in 1613, still exists. This was the original village pub which also provided accommodation for travellers and their horses and carriages. After 1930 it was converted into two dwellings and the licence transferred to the Heversham Hotel, now the new Blue Bell This building was once also the parish vicarage. Opposite the old Blue Bell the Heversham Metal Industry flourished from 1891 to 1927. Men and boys attended to pursue the craft of making useful household articles and ornaments from sheets of copper and brass. When the village was by-passed by the Princes Way, opened in 1927 by the then Prince of Wales, sales ceased. At an exhibition in the Royal Albert Hall in June 1913 Queen Alexandra purchased a coalscuttle made in Heversham. Dallam School was established in 1984 when the Heversham Grammar School and Milnthorpe Modern School were combined, thus bringing to an end the Grammar School status which had existed on this site since 1878, and since 1613 at the old Grammar School on Heversham Head, the one hundred and twenty-three metre high hill which overlooks the village on the east side. A walk to the top of Heversham Head is rewarded by a wonderful panoramic view – the one thing that has hardly changed over the century. To the south-easterly direction one can see Ingleborough and turning clockwise the Kent Estuary, Whitbarrow Scar and the Lakeland fells. RETIRED insurance underwriter Malcolm Sisson, 84, is well placed to write a book about these two villages having lived in the area all his life. Indeed, his family have lived in Heversham since 1833. This book is full of many photographs from Mr Sisson's own collection and a few borrowed, where necessary. It takes the reader back in time on a journey through the two villages, starting at Levens Bridge. On the way it visits the different houses and properties and describes who has lived there over the last 100 years or so. An insight is given into early village life. There is mention of notable families such as the Argles at Eversley and the Austins who lived at Heversham House. Mrs Agnes Argles was the sister of Mary Wakefield, the founder of the Kendal Music Festival. They were the gentry and owned much of the land, farms and cottages. The book closes with the Millennium celebrations and a picture of the primary school children helping to place a time capsule in the foundations of a panoramic indicator on Heversham Head. Like the time capsule, this book will give future generations an invaluable glimpse back to what life in these two communities was like in the 20th century. The last book written about the village was almost 30 years ago.